Chicago IL—August 2018—Food Logistics magazine names Transportation One to its annual list of leading third-party logistics and cold storage providers in the food and beverage industry. This will be the fifth consecutive year that Transportation One has received this honor. “T1 takes pride in being intimately involved and focused in managing freight within the Food & Beverage vertical due to the sensitive nature of commodities being moved. This is a niche we have worked hard to develop since our inception, which has allowed us to become trusted experts with many years of experience and contributed to our overall success. As a result, our customers come to us every day for solutions to their current and existing problems, and for guidance in designing their supply chains, which has allowed us to set ourselves apart as a leader and strategic partner,” notes Jamie Teets, CEO, Transportation One. The food and beverage supply chain increasingly relies on third party logistics firms who specialize in temperature-controlled freight. We here at Transportation One have focused on building relationships with carriers who have the equipment and demonstrated reliability to haul fresh, chilled and (deep) frozen food safely from the very beginning. Our carrier pool is highly vetted to meet strict standards, and constantly monitored to ensure the quality of service our customers have grown to expect. Cheers to the entire Transportation One Team for being on the Inc5000 five years in a row! Transportation One is the true definition of growth in the third-party logistics industry. Transportation One has joined forces with FreightRover to keep on the cutting-edge of industry technology. A tight market and high rates have left many shippers and 3PL’s scrambling for solutions. 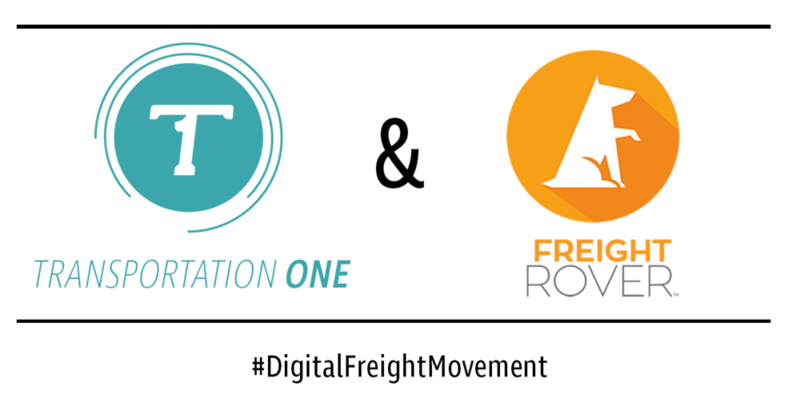 To stay ahead of the curve, Transportation One has partnered with FreightRover to build a digital freight marketplace. Together, we will also be creating a proprietary transportation management system tailored to support Transportation One’s exponential growth. Transportation One will now provide our customers with a private, proprietary freight marketplace, as well as a carrier-facing portal for quicker carrier payments (quick pay options available) and overall seamless payment automation. In addition, Transportation One will use FreightRover’s white-labeled SmartLTL to instantaneously gather rates from multiple carriers and simplify LTL shipment management. FreightRover’s dynamic suite of digital products are positioned to increase Transportation One’s efficiency and productivity, improve margin to generate customer cost savings, and reduce overall operating costs. By providing customers with personalized service and employees with software that eases everyday manual processes, Transportation One is poised to continue our rapid growth. FreightRover (www.freightrover.com) offers a suite of products that reach alternative capacity, streamline manual work processes, improve working capital, and increase bottom line revenue. From its “Your Load Board – Your Way,” to dynamic carrier payment processing and LTL rating and execution, FreightRover arms its customers with valuable tools to compete and win in the new digital logistics marketplace. Think of each solution like a light switch – turn on what you want, and stay in control of your freight. Transportation One (www.transportationone.com) is a full-service, multi-modal logistics provider dedicated to meeting the demands of the transportation industry. Our innovative, energetic team understands the constantly evolving needs of shippers and carriers alike. We invest heavily in cutting-edge technology and experienced logistics professionals, allowing us to deliver superior service to all our clients. At Transportation One, we provide worry-free shipping services at prices that won’t bleed your wallet. We build mutually beneficial relationships with each customer so that at the end of the day everyone goes home happy. We operate in both domestic and international marketplaces, introducing innovative solutions for every supply chain we encounter. Put simply, when it comes to transportation, we’re the one you want. We are proud to be on the @CrainsChicago Fast 50 two years in a row! The logistics industry moves fast and so do we. Check out our career opportunities to be a part of our continued success and growth! Transportation One has been named to the Transport Topics Top Freight Brokerage Companies list for the second year in a row. Companies on the Top Freight Brokerage list are ranked based on net revenue for the most recent 12-month period. The list also features a breakdown of the top freight brokerage firms, air and ocean freight forwarders, warehouse operators and dedicated contract carriage service providers in the United States and Canada. To read more about the issues facing logistics companies and to get the latest news on the trucking and freight transportation industry, visit Transport Topics at http://www.ttnews.com/top50/freightbrokerage/2018. The Initiative for a Competitive Inner City (ICIC) and Fortune have announced that Transportation One had been selected for prestigious 2017 Inner City 100 list. This recognition places Transportation One in an exemplary lineage of over 900 fast-growing and innovative inner city businesses. ICIC’s Inner City 100 is an annually compiled and released list featuring high-power, high-potential businesses from around the country with headquarters in inner cities. Each company is selected by ICIC with help from a national network of nominating partners who seek to identify, spotlight, and further enable the named companies’ innovative urban entrepreneurship. Ranked by revenue growth, the esteemed recipients go on to have their names published in Fortune. Transportation One ranked 39th overall on the list of 100. The full list can be viewed on the Fortune website here. The Inner City 100 program recognizes and supports successful inner city business leaders, and celebrates their role in providing innovation and job creation in America’s cities. These companies strengthen local American economies, provide job opportunities for underrepresented communities, and drive forward economic and social development. Inner City 100 Methodology: The Initiative for a Competitive Inner City (ICIC) defines inner cities as core urban areas with higher unemployment and poverty rates and lower median incomes than their surrounding metropolitan statistical areas. Every year, ICIC identifies, ranks, and spotlights the 100 fastest-growing businesses located in America’s inner cities. In 2017, Companies were ranked by revenue growth over the five-year period between 2012 and 2016. ICIC is a national nonprofit founded in 1994 by Harvard Business School professor Michael E. Porter. ICIC's mission is to promote economic prosperity in America's inner cities through private sector investment that leads to jobs, income and wealth creation for local residents. Through its research on inner city economies, ICIC provides businesses, governments and investors with the most comprehensive and actionable information in the field about urban market opportunities. The organization supports urban businesses through the Inner City 100, Inner City Capital Connections and the Goldman Sachs 10,000 Small Businesses programs. Learn more at www.icic.org or @icicorg. And guess what? Transportation One is a finalist! Out of thousands of businesses in Chicago, we are so very honored to be chosen for this award. The ordered list will be released on June 22nd. In the meantime, we're celebrating! Transportation One is a Transport Topics Top Freight Broker! We are very excited to have been named to the list of Top Freight Brokerage Firms by Transport Topics. Top freight brokerage firms are ranked based on net revenue and include a description of the types of freight handled, plus the number of loads or shipments, if available, for the 12 months ended Dec. 31, 2016, unless otherwise noted, in North America. Check out the full list on their website! We might have had a pretty awesome party. You can check out the other pictures here. This just in: we've formed a partnership with Chicago Athletic Clubs. Transportation One now offers employees a discounted All Access membership at Chicago Athletic Clubs across the city. We're ready to stay in shape, and stay awesome, winter be darned! The Initiative for a Competitive Inner City (ICIC) and Fortune have announced that Transportation One had been selected for prestigious 2016 Inner City 100 list. This recognition places Transportation One in an exemplary lineage of nearly 900 fast-growing and innovative inner city businesses. Transportation One ranked 36th overall on the list of 100. The full list can be viewed on the Fortune website here. In addition to announcing the list, company CEOs were invited to gather for a full-day event featuring thought-provoking sessions, insightful leadership advice, and robust networking opportunities. Past winners have reported meeting future multi-million dollar investors as a result of appearing on the Inner City 100 list and attending the accompanying colloquium. The rankings for each company were announced at the Inner City 100 Conference and Awards Ceremony on Wednesday, September 14, 2016 at the Aloft Hotel in Boston, MA. Before the awards celebration, winners gathered for a full-day business symposium featuring management case studies from Harvard Business School professors and interactive sessions with top CEOs. Keynote speakers at this year’s event included Interim CEO of Staples Shira Goodman, Chairman and CEO of Pinnacle Group and Inner City 100 alumnus Nina Vaca, and Harvard Business School Professor and ICIC Founder and Chairman Michael E. Porter. Other speakers included Corey Thomas, CEO of Rapid 7, Loren Feldman of Forbes, Lynda Applegate and Amy Edmondson from Harvard Business School, John Stuart of PTC, Robert Wallace, CEO of Bithenergy, and Brook Colangelo of Houghton Mifflin Harcourt. Of particular note, ICIC inducted 14 businesses into the Inner City 100 “Hall of Fame” as homage to these companies’ successive growth achievement of five or more years. For only the second time in ICIC’s history of 18 years a business has made the Inner City 100 for the 10th time: Raining Rose of Cedar Rapids, IA. Such consistent appearances affirm the resilient upwards trajectory of, and demonstrated need for, local inner city businesses like the ones celebrated on this year’s list. “We are extraordinarily proud of these pioneering entrepreneurs who lead the way in economic revitalization in America’s inner cities,” says Steve Grossman, CEO of ICIC, of the list of 100. Boasting an average five-year growth rate of 458 percent between 2011 and 2015, the 2016 Inner City 100 winners represent a wide span of geography, hailing from 42 cities and 25 states. Collectively, the winners employed 7,324 people in 2015, and on average over a third of their employees live in the same neighborhood as the company. Employ 7,324 workers total in 2015. Created 4,696 new jobs in the last five years. On average, 34% of employees live in same neighborhood as the company. Average company age is 16 years. Average 2015 revenue is $12.2 million. 6% of the winners are certified B-Corps. 26 industries represented in the top 100. Inner City 100 Methodology: The Initiative for a Competitive Inner City (ICIC) defines inner cities as core urban areas with higher unemployment and poverty rates and lower median incomes than their surrounding metropolitan statistical areas. Every year, ICIC identifies, ranks, and spotlights the 100 fastest-growing businesses located in America’s inner cities. In 2016, Companies were ranked by revenue growth over the five-year period between 2011 and 2015. This list was audited by the independent accounting firm Rucci, Bardaro, and Falzone, PC. CHICAGO, IL — August 17th, 2016 — Inc. Magazine today ranked Transportation One NO. 1832 on its 35th annual Inc. 5000, an exclusive ranking of the nation's fastest-growing private companies. The list represents the most comprehensive look at the most important segment of the economy—America’s independent entrepreneurs. Companies such as Yelp, Pandora, Timberland, Dell, Domino’s Pizza, LinkedIn, Zillow, and many other well-known names gained early exposure as members of the Inc. 5000. The 2016 Inc. 5000, unveiled online at Inc.com and with the top 500 companies featured in the September issue of Inc. (available on newsstands August 23rd) is the most competitive crop in the list’s history. The average company on the list achieved a mind-boggling three-year growth of 433%. The Inc. 5000’s aggregate revenue is $200 billion, generating 640,000 jobs over the past three years, or about 8% of all jobs created in the entire economy during that period. Complete results of the Inc. 5000, including company profiles and an interactive database that can be sorted by industry, region, and other criteria, can be found at www.inc.com/inc5000. Transportation One is a full-service, multi-modal logistics provider dedicated to meeting the demands of the transportation industry. Our innovative, energetic team understands the constantly evolving needs of shippers and carriers alike. We invest heavily in cutting-edge technology and experienced logistics professionals, allowing us to deliver superior service to all of our clients. At Transportation One, we provide worry-free shipping services at prices that won’t bleed your wallet. We build mutually beneficial relationships with each customer so that at the end of the day everyone goes home happy. We operate in both domestic and international marketplaces, introducing innovative solutions for every supply chain we encounter. Put simply, when it comes to transportation, we’re the one you want. Founded in 1979 and acquired in 2005 by Mansueto Ventures, Inc. is the only major brand dedicated exclusively to owners and managers of growing private companies, with the aim to deliver real solutions for today's innovative company builders. Winner of the National Magazine Award for General Excellence in both 2014 and 2012. Total monthly audience reach for the brand has grown significantly from 2,000,000 in 2010 to over 15,000,000 today. For more information, visit www.inc.com. CHICAGO IL —August, 16th, 2016 — Food Logistics, the only publication exclusively dedicated to covering the movement of product through the global food supply chain, has named Transportation One to its 2016 Top 3PL & Cold Storage Providers list. The Top 3PL & Cold Storage Providers list serves as a resource guide of third-party logistics and cold storage providers whose products and services are critical for companies in the global food and beverage supply chain. Companies on this year’s 2016 Top 3PL & Cold Storage Providers list will be profiled in the August 2016 issue of Food Logistics, as well as online at www.foodlogistics.com. Andy, our Carrier Sales Manager, looking sharp. We're always focused on using cutting-edge technology here at Transportation One. That extends to our work stations! We've started adding a few standing desks to the office. Not only is standing periodically during the work day better for you, these adjustable desks look pretty cool too. Looking for the best third party logistics company to partner with? Then look no further! For the second year in a row Transportation One was ranked as one of the Top 100 3PL & Cold Storage Providers by Food Logistics Magazine! More than simply moving freight, we strive to haul shipments in an environmentally friendly manner. We have been a SmartWay Transport Partner since 2011. SmartWay is an EPA program promoted to developing partnerships with transportation companies who are committed to fuel efficiency and reducing transportation-related emissions. Here at Transportation One we are committed to working hard to bring our customer and carrier partners the best service possible! As the saying goes – work hard, play hard – we also enjoy celebrating our accomplishments together in and outside of the work place! 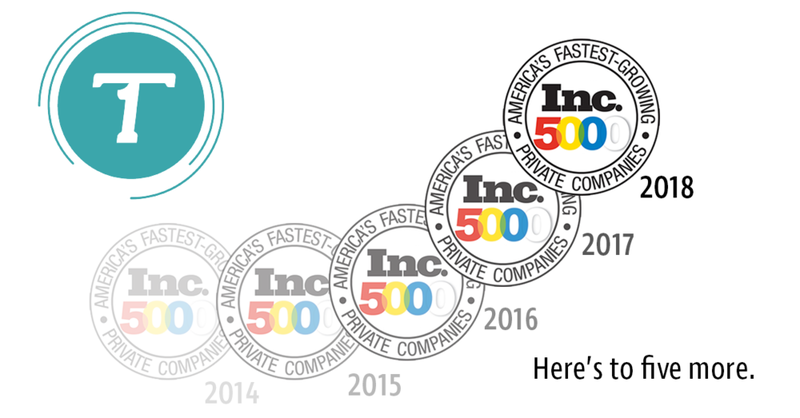 In 2014 we were ranked #755 of the fastest growing private companies in America by Inc 5000. The success wouldn’t be possible without our hard-working employees, and our devoted business partners – so we thank YOU for your continued commitment to our success! We’re a NASTC Best Broker! If you’re doing business with us – you’re doing business with one of the Best Broker’s out there! We were recently listed as one of the Best Broker’s by The National Associations of Small Trucking Companies (NASTC). The NASTC Best Broker Program is comprised of the top 5% of all brokers across the country. Best Brokers have been screened as to payment policy and history, and have been highly recommended by NASTC members.